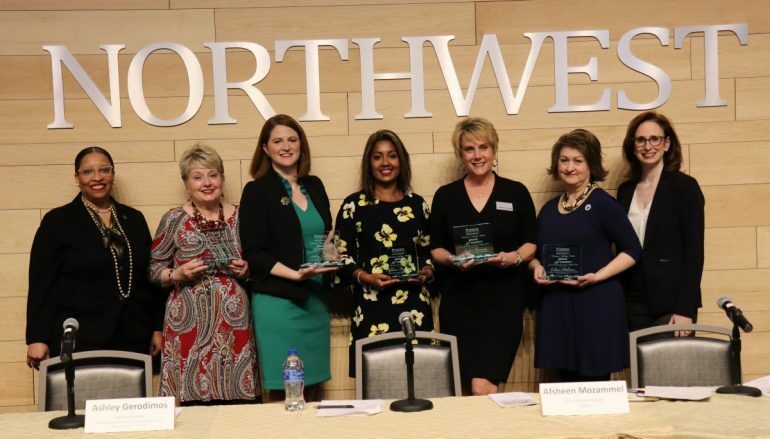 Five Purdue University Northwest (PNW) alumnae from a variety of backgrounds delivered an inspirational message and shared how their bravery helped break through the glass ceiling recently at the university’s “Breaking the Glass Ceiling” event. The alumnae discussed their experiences and wisdom about what it takes to be a successful woman in today’s competitive workplace. Pictured are (l to r): Karen Bishop Morris, interim dean of the Honors College at PNW; Marsha M. King, dean and associate professor at University of St. Francis, Crown Point Campus; Ashley Gerodimos, executive director of the PNW Alumni Community and Strategic Events; Afsheen Mozammel, senior process engineer at DENSO Manufacturing; Andrea Pearman, president and CEO of Diversified Marketing Strategies, Inc.; Colleen N. Hickman, president of Northwest Indiana World Trade Alliance; and Lori Feldman, PNW associate vice chancellor for academic affairs.